Parenthood, for me, is a happy chaos. You think about mundane details like - has their nails been cut to monumental decisions like should I give in to that extra minute??? 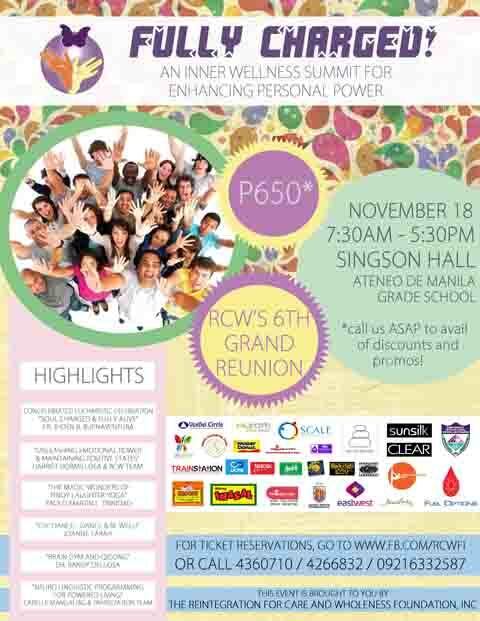 RCW Foundation (later with their credentials), put together Fully Charged: An Inner Wellness Summit for Enhancing Personal Power which will be held on November 18, 2012, Sunday, from 7:30am-5:30pm at Singson Hall, Ateneo de Manila Grade School. For only P650, you can recharge your life batteries and empower yourself through an inspiring and engaging series of conferences, life-changing focused activities and group exercises by Inner Wellness Specialists and Experts. REINTEGRATION FOR CARE AND WHOLENESS FOUNDATION, INC (RCWFI), also known as The Caring Group, offers Integrative and Transformational Programs that enhance Wholeness and Fullness of Life. Founded by Harriet H. Hormillosa, RCWFI is psycho-spiritual healing, wholeness and fullness of life through the transformation of consciousness. Their roster of clients includes top corporations like Citigroup, Nestle and ABS-CBN and schools like Ateneo, Poveda and Xavier to name a few. Address: RCW Foundation, Inc. Partnership Center, 59 Salvador St., Varsity Hills, Loyola Heights, Q.C. Christmas 2015 Starts in Joyful Note at SM Mall of Asia's "Santa's Very Merry Wonderland"
Hi tiny! Yay! Thanks I have given your name to Allyson of RCW and you just have to give your name to the registration booth to get in for free. Praying for a a day filled with Wellness and Peace! Namaste! I have been working for a well known call center for almost 6 years now where stress and lack of sleep were the main challenges at the work place. At home I have my 7 kids to take care,feed and guide. It has not been easy to leave them on their own while I make ends meet to earn a decent living. When I discovered the world of blogging almost a year ago, I somehow realized that I could write. Though most of my posts pertain to my kids and topics close to my heart, it is still time spent away from them, making me guilty even asking if it was still worth it. This plus the continuous demands of mothering and that of a working mom at times drive me to the wall that I forget who I really am. It would really be great to find my center again. I not only owe it to my kids to be a better mom but more so to myself as well to be a better person. And I would really love to get a free ticket to this event. I also feel guilty about blogging sometimes because it takes me away from my baby (1.7mos old). Of my 3 kids, he is the only one who cries when I leave and I wonder if it is because I am “working/blogging” unlike with the first 2 kids where I was really full time. Please e-mail me your full name and contact details so I can relay it to the organizer who would welcome you on Sunday. I will also give you the name and contact details of the person you will look for. I am so excited for you to take this short journey this Sunday. I think it is a good start to connecting to your center. Too bad I can’t join. Now, I’m thinking maybe I need to attend this more than the blogging summit which is on the same day. Need to connect to my center too. All the best to you Sarah.